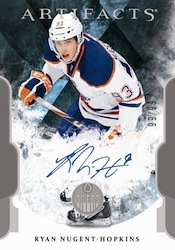 Upper Deck has announced the 16-player checklist for the 2011-12 Upper Deck Artifacts Hockey Autograph Rookie Redemptions. The cards are numbered with roman numerals according to Upper Deck's rankings. Understandably, first overall pick Ryan Nugent-Hopkins is the best pull and everyone else falls in after him. All cards are numbered to 99. 2011-12 ARTIFACTS ROOKIE AUTOGRAPH REDEEMED #VI MARK SCHEIFELE 83 99 ! !